It has been years since I wore a watch regularly. Considering I’m rarely more than an arm’s length away from any smart device, I’d weaned myself away long ago — relying instead on my phone, laptop or tablet to give the time. And in the past few years, with many different smartwatch options popping up, from Apple’s offering and an array of Android Wear watches, I’ve browsed regularly, but not yet found the perfect fit for me for both utility and simplicity — until Fitbit announced the Blaze in January. In the ensuing two months, I’ve been captivated by the Blaze watch. Most smartwatches fall into two camps really, as I see it — too big or too tied to iOS. While this Christmas, I got my wife the Android Wear powered Moto 360, and she likes it, I didn’t get myself a matching set for two reasons — the first being that I hoped the watch’s profile would get even more slim in a newer generation, and second, I am really seeking functionality that goes beyond what I already get from my various Android devices — instead of just being a mirror of activity I already knew. 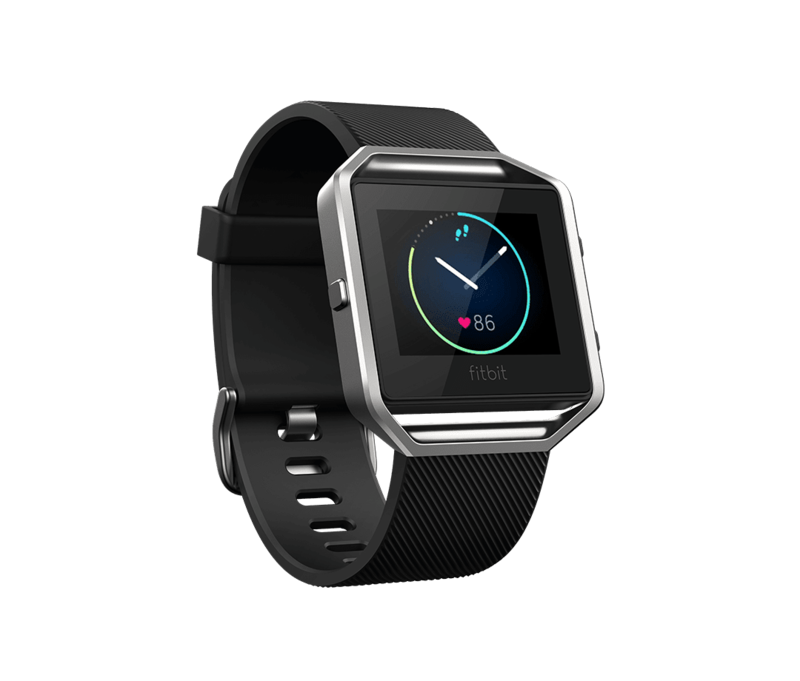 The Fitbit Blaze was different. 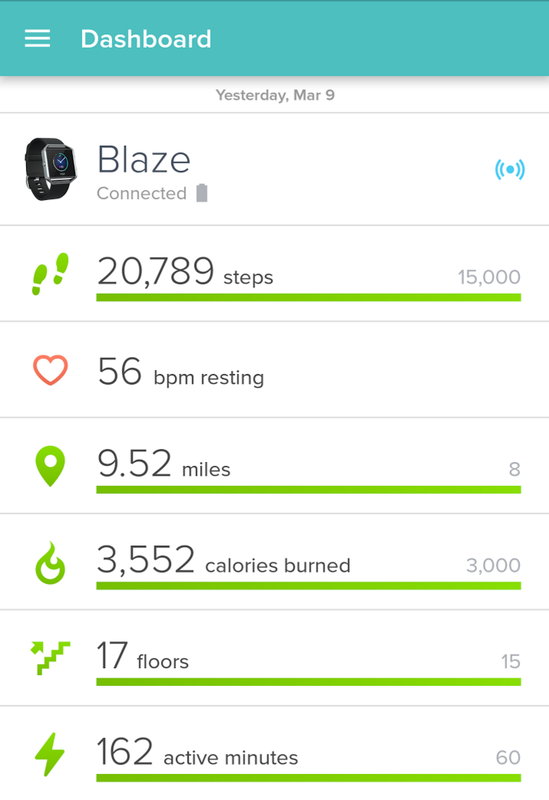 Not only did the Fitbit Blaze immediately extend my Fitbit activity tracking lifestyle, on which I’ve racked up millions of steps and hundreds of connected friends over the last few years, but the physical appearance of the device was slim and direct. Clean to look at. Light weight. And it didn’t try to do too much. The Blaze is, at first, a timepiece, and second, a fitness tracker, easily displaying your daily step totals, heart rate, and calories burned, much like any other Fitbit device, but in a new and attractive way that got my attention unlike any of their other armbands ever have. Also, in contrast to other smartwatches, the Blaze’s $199 price was actually very reasonable, compared with the least expensive Apple watch at $349 or the Moto 360 Sport at $299. While you can get cheaper options, like the Asus ZenWatch 2 for $149, you’ve got the idea. So over the last couple months, I visited the Fitbit Blaze site so often it became one of the saved home pages on my Chrome browser’s start page — just in case I wanted to look again. And as March approached, when Fitbit said device would finally ship, I finally took the plunge and bought one. I bought the Blaze on the 18th and it shipped only two days later. And — get this. It shipped ahead of schedule. Like weeks ahead of schedule. 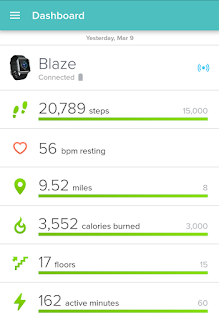 So instead of having to wait all the way into March to get my hands on the Blaze, Fitbit exceeded expectations, like they always have for me, and the device showed up at my doorstep on February 23rd. So for just over the last two weeks, I’ve been tracking my steps and heart rate during all waking hours on my the Blaze. Like any good data-driven geek (I work on Google Analytics, so data-driven equals yes), for the bulk of the first two weeks, I wore both my new Blaze watch and carried around the Fitbit One tracker I’ve used for the last few years. I believe Fitbit is the gold standard for step counts and daily activity, so if the two were to dramatically vary, that would not be cool. From what I’ve found, the watch is within 5% of daily step count from the One. Like any good ego-driven activity enthusiast, my bias as to what number is “correct” is the higher one. But the same 2,000 or so steps still count as a mile and so on. As for the features of the watch, they are very easy to grok. The leftmost button on the included band and housing swaps between screens. Or you can just tap the Blaze with your finger and swipe left or right. The first option is their “Today” feature, which captures your step total, displays your current and resting heart rate, your accumulated mileage, estimated calories burned, and floors climbed on the day. You can also swipe track individual exercise activities, like Run, Bike, Weights, Treadmill, Elliptical and Workout. I’m no gym rat, so I probably won’t use most of those, but for others who do, it’s valuable. 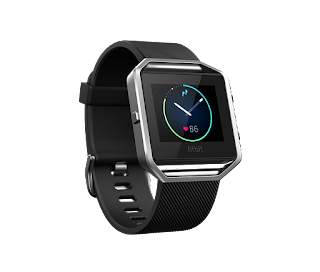 The Fitbit Blaze also connects by Bluetooth with your phone, and can show a subset of notifications — namely integration with your calendar and text messaging. While other smartwatches give pretty much every phone notification equal access, the Blaze smartly knows when to stop. I don’t need social notifications or email notifications on the watch. Just alerts that are time relevant. The true test of any new device is if you use it regularly beyond the honeymoon period — when you’re trying something out and justifying a purchase. After four years of wearing my Fitbit daily, proving my fanaticism and even racking up 100,000 steps in a single day, the device is pretty much an extension of me. It goes where I go and reports on whether I’ve been too sloth or burned off enough energy. I even lost 30 pounds in six months after first getting connected. No other device has had that kind of permanence for me. The Fitbit Blaze is the first offering that had me consider trading up, and it hasn’t left my side, except to charge every few nights. I don’t need yet another email device, or yet another device to browse Twitter and make phone calls. I just wanted a smarter watch that looked good and pushed me to keep moving. For every Fitbit addict, this is the watch you’re looking for.